For over the last 20+ years, Joey Beltram is considered one of the pioneers and a legendary producer of Techno and House. He has recorded on many of the biggest labels of the early 90’s such as Nu-Groove, Tresor, Warp, Transmat, and R&S records. Much of his music during that time is widely acknowledged as groundbreaking. Beltram has also been heralded as a major influence by many of today’s DJ’s and producers including Daft Punk (as mentioned in their song “Teachers”). He has also produced many Techno staples of the 1990’s including “Energy Flash”, “Mentasm”, “Forklift”, “Ballpark” and “Game Form”. 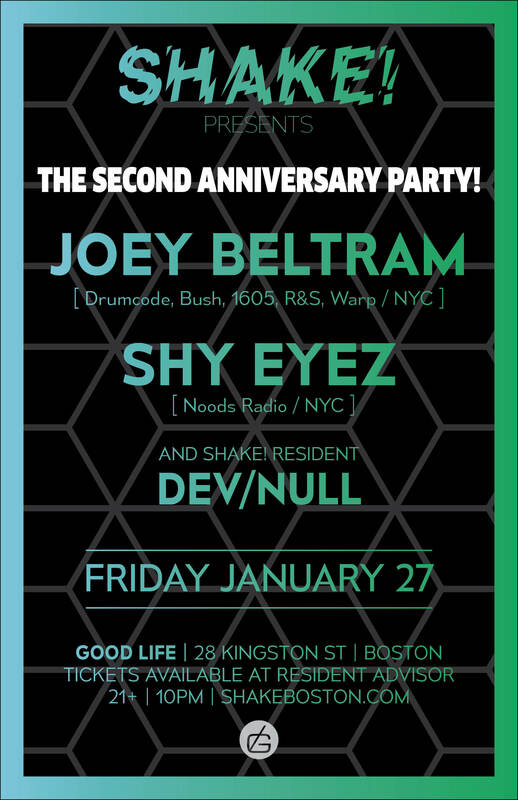 In more recent years Joey Beltram has worked with and remixed artist’s and DJ’s such as Adam Beyer, Carl Cox, Umek, Oliver Huntemann and Steve Lawler. Between her bi-weekly happy hours at Bossa and her monthly residency at Bristol’s Noods Radio, Shy Eyez is in the booth more often than not. Recent gigs include Discwoman, Confused House and GROOVY GROOVY, with appearances on the Lot Radio and WNYU as well as a guest mix for Berceuse Heroique. Drawing continual inspiration from the many DJs she makes a point of seeing behind the decks, as well as the numerous radio shows she religiously follows, her DJ sets span countless genres—from techno to breakbeat to experimental U.K. dubstep and beyond. In addition to DJing, she recently ventured into booking dnb/bass/breaks/non-4-2-the-floor-techno talent for her party series, BreakZ—which has already hosted sets from Matrixxman, Dieselboy and Batu.